Gite Le Segur has a homely feel with a modern standard. Property 3: Gite Le Segur has a homely feel with a modern standard. Weir Cottage: Private Lakeside Gite In Idyllic Location. A Great Place To Relax! Property 4: Weir Cottage: Private Lakeside Gite In Idyllic Location. A Great Place To Relax! 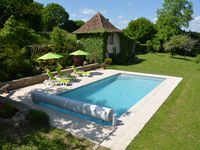 Gite Le Segur is a beautiful and newly renovated country house. We had a lovely stay in this charming and peaceful area of France. Owners Karl and Amanda are wonderful and will see that your stay is a memorable one. I very highly recommend gite Le Segur and would definitely stay there again.